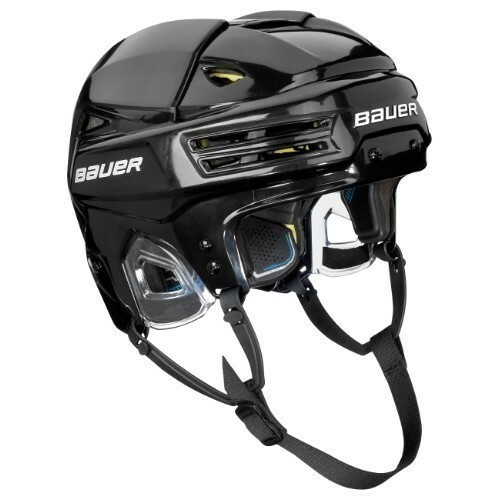 The Bauer RE-AKT 200 Helmet is the most protective helmet Bauer has released to date. Compared to the previous RE-AKT 100, this RE-AKT 200 is 25% more protective! The key molded side foam pads eliminate gaps in protection unlike any other helmet on the market. Also unique to the RE-AKT 200 is the heat-moldable FitPlate, which provides a customizable occipital lock. Simply remove the FitPlate, heat it like the SpeedPlate footbeds, place it back into the helmet and wear it for 10 minutes; this allows the material to settle and mold perfectly to the player's head. Along with this new occipital lock, the NextGen SuspendTech Liner helps protect from all types of impact forces while ensuring some of the best comfort around.